We think cake tastes even better when it’s raising money for the vital work of Red Cross. It’s deliciously simple. When you enjoy a slice of cake and a cuppa at a Big Cake Bake event the money raised will help connect more people to their strengths, each other and to the things we all need to build good lives. Healthy cooking workshops with young parents. Grocery vouchers for people who have found safety in Australia. 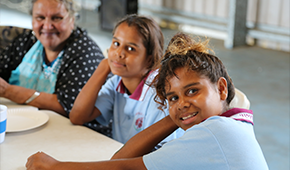 Life-saving clean water in remote communities. Read on to see how you’ll be making the world better, one bite at a time. Sara, who lives with Autism, wanted to work and make a meaningful contribution to her community. But there were few options for her. 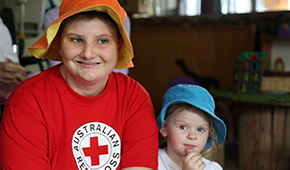 “Sara had so much to give but didn’t get the opportunity,” her mum Debbie told us. Then Sara, with her Red Cross case worker, made a connection. Together they connected Sara’s friends at an aged care home with children at a day care centre. The result? Sara has found a wonderful sense of purpose and sparked a connection between children and ‘grandparents’. When you get together with family, friends and colleagues this October you’ll be helping counter loneliness and social isolation. transports a sick or elderly person to a medical appointment. connects someone who is isolated and lonely with a Red Cross volunteer for a month. After fleeing conflict, Nur and her young family arrived in a refugee camp to face a new struggle: no clean running water. Like millions of people, Nur seeks simple basics like clean water and safe toilets to help her build a better life for her family. Thankfully, with the support of contributions from people like you we were able to install water pumps throughout the camp. Nur, and families like hers, now have access to simple, life-changing clean water and safe toilets. By fundraising with us this October, your Big Cake Bake event will help more women build healthy families and communities. will help provide safe births for mothers and babies under the supervision of a trained midwife in a village community centre. supplies an Indonesian family with tools and training to grow nutritious food at home. Fundraise with us this October and help more people make life-changing connections.